Town councils and community groups are groups based on bonds of shared audiences consisting of neighbors in the community. Their energetic activities—including friendship programs on preventing disasters and crime, as well as traffic safety—make our communities even better. In this issue, we introduce the activities of the Nishi-Toyama Tower Homes Community Group, whose members are all condominium complex residents. 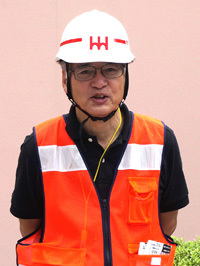 About 70 percent of its condominium residents are members of the Nishi-Toyama Tower Homes Community Group. The group organizes community programs such as summer and winter festivals, flea markets and “Clean Day” cleanup activities on the first Sunday of each month. To work together and help each another during a disaster, it is vital to build face-to-face ties with both other condominium residents and members of the surrounding community. This community group was established because the condominium maintenance association was finding it difficult to participate in joint activities in the surrounding community. Although the group’s members are all condominium complex residents, it also participates in the Shinjuku Association of Town Councils and Okubo Community Mimamori-tai Guard Association* to strengthen friendly ties with the surrounding community. Its activities include patrolling, which is not restricted to the condominium complex. Working together with neighborhood town councils and other community groups, this group is gradually strengthening the whole community. Now the group also participates in the Hyakunincho mikoshi (portable shrine) procession and other community events that excite the community. * Okubo Community Mimamori-tai Guard Association: This association consists of groups such as the Okubo district police, elementary schools, kindergartens, PTA, town councils and community groups. They conduct patrols to maintain safety in the community, and share information concerning crimes that occur in the area and countermeasures against crime. 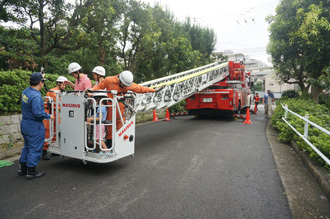 The ladder truck that extends to a height of forty meters—the height of a thirteen-story building—is popular among everyone from children to adults. This event stirs excitement every year, strengthening friendly ties among community residents. 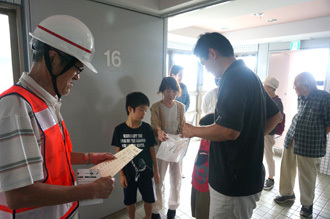 The community group and maintenance association at Nishi-Toyama Tower Homes organize a disaster prevention brigade and conduct various activities, including disaster-related drills presented in cooperation with the Fire Department. A stamp rally was introduced three years ago so that children can have fun while participating in drills, increasing the number of participants of all ages. 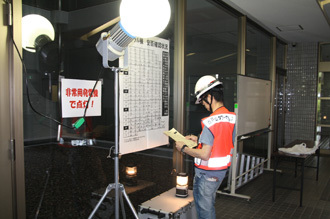 A magnetic sheet that says “We Are Safe” (see left illustration) has been distributed to all condominium units. When a disaster strikes, residents place this sheet on their front door to let others know they are safe. The brigade will call on units not displaying their sheet or that have no signs of evacuation to confirm the inhabitants’ safety. This vital first step is being emphasized to ensure that people escape before it is too late. Why Not Join the Town Council or a Community Group? To find out more about joining your regional town council or a local community group, please contact your regional Branch Office or the Regional Community Division for contact information on town councils and community groups. 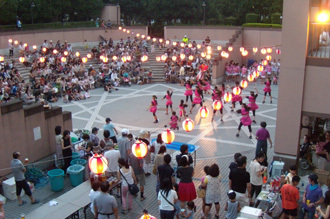 For more information on town councils and community groups in Shinjuku, please read the Shinjuku Association of Town Councils website, Shinjuku 11 (http://www.shinjuku11.jp/).